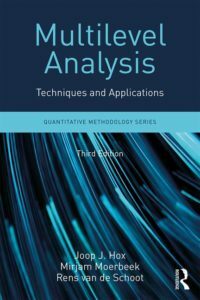 This is a website (in ongoing development) for the third edition of Multilevel analysis: Techniques and applications (Hox, J. J., Moerbeek, M., & Schoot, R, 2018). More information on the authors, earlier editions, datasets, the International Multilevel Conference, useful links/literature, a detailed list of chapter contents, the second chapter of the book on the ‘Basic Two-Level Regression Mode‘, and an erratum can be found on this website. Tutorials on how to do a multilevel analysis in HLM or in Mplus have now also been uploaded. This book is intended as an introduction to the world of multilevel analysis. Most of the chapters on multilevel regression analysis should be readable for social and behavioral scientists who have a good general knowledge of analysis of variance and classical multiple regression analysis. The book also includes advanced extensions, making it useful as both an introduction for students and as a reference for researchers. Some of these chapters contain material that is more difficult, but these are generally a discussion of specialized problems. In addition to its being an introduction, this book describes many extensions and special applications. As an introduction, it is usable in courses on multilevel modeling in a variety of social and behavioral fields, such as psychology, education, sociology, and business. The various extensions and special applications also make it useful to researchers who work in applied or theoretical research, and to methodologists who have to consult with these researchers. The basic models and examples are discussed in non-technical terms; the emphasis is on understanding the methodological and statistical issues involved in using these models. For a longer description of the book and multilevel modelling see the Intro to Multilevel Analyses page or see the publisher’s website. One important change compared to the second edition is the introduction of two coauthors. This reflects the expansion of multilevel analysis; the field has become so broad that it is virtually impossible for a single author to keep up with the new developments, both in statistical theory and in software. Compared to the second edition, some chapters have changed much, while other chapters have mostly been updated to reflect recent developments in statistical research and software development. One important development is increased use of Bayesian estimation and development of robust Maximum Likelihood estimation. The chapters on multilevel logistic regression and on multilevel ordered regression have been expanded with a better treatment of the linked problems of latent scale and explained variance. In multilevel structural equation modeling (MSEM) the developments have been so fast that the chapters on multilevel confirmatory factor analysis and on multilevel path analysis have been significantly revised, in part by removing discussion of estimation methods that are now clearly outdated. The chapter on sample size and power and the chapter on multilevel survival analysis have been extensively rewritten.